(NEW YORK – Tuesday, October 27, 2015): Eric Boulden, President of Jump Branding & Design, Inc. and Strategic Director Jason Hemsworth were in New York on Tuesday night to receive the latest awards for their work on the development of Via Cibo, the latest concept from Alex Rechichi, career-long founder of chef-inspired restaurant brands. Boulden and Hemsworth attended the Transform NA Awards, the first Transform Magazine awards to be handed out in North America. Jump won a Gold for Best Strategic /Creative Development of a New Brand, and a Bronze for Best Use of a Visual Property; Photography/Illustration/Digital. 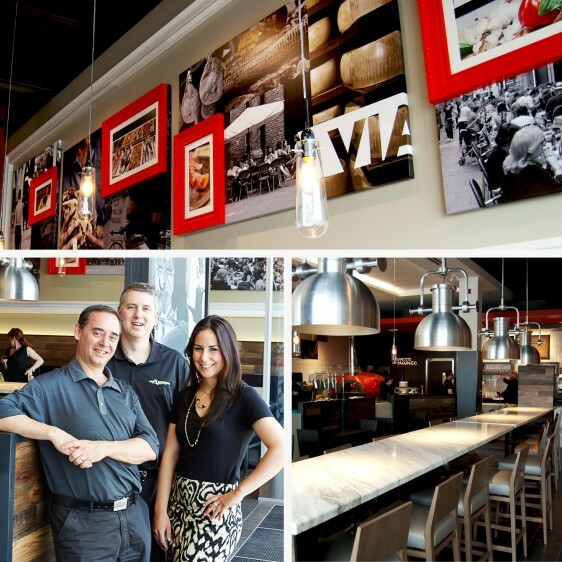 Via Cibo is an authentic Italian fast casual restaurant with locations in Toronto and Calgary, and several more in development. The name is taken from the separate Italian words: “Via”, meaning street; and “Cibo”, meaning food. The two words come together to create a nod to more than just Italian food, but to the entire way of life that has made Italy such a romanticized and well-travelled destination. Via Cibo is a chef-driven concept that captures the essence of Italian street food, updating the tired rhetoric of “authentic” Italian to bring a taste of modern Italy to North America. Jump worked on the concept from the beginning, touring Italy with the client to accurately capture the Italian way of life. They developed the name, logo, signage, artwork, communication and messaging throughout the concept, as well as the architectural interior design and website design. “We took our inspiration from the very streets that are the lifeblood of the Italian social scene, and translated that into an experience that is credible and authentic,” says Boulden. To develop the artwork for Via Cibo, Boulden sent a photographer back to Italy to retrace their steps and capture the street scenes and food culture that had inspired the concept. “Traditional North American Italian dining does nothing to accurately reflect the experience of eating and living there, and we envisioned an artwork package that would bring the modern Italian city and cuisine to life,” said Boulden. The resulting artwork package is a journey through storied cities to capture the streets, food and people that define Italy and shape the vision of Via Cibo.